Simple yet ingenious way to keep your bird seed safe! 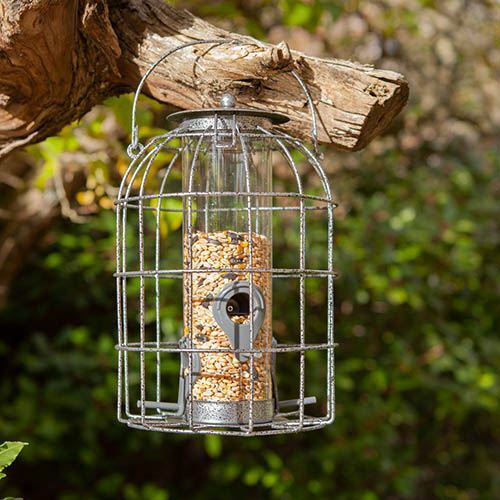 Our range of squirrel proof bird feeders ensure your bird feed will not be stolen. Innovative blocking cage design prevents squirrels from stealing feed. Simple design allows small birds to access the feed but keeps squirrels out. No complicated gizmos involved - you'll be sure no squirrels will get near the bird feed! One of the main robbers of bird feed in gardens is the squirrel, infuriating and confounding many gardeners and denying wild birds of their winter feed! Now you can protect your precious bird feed from those pesky squirrels and let your feathered friends enjoy their meal! Each squirrel-proof feeder is surrounded by a cage to protect the seed from squirrels and other unwanted garden pests. By using a simple yet innovative blocking cage, squirrels are prevented from stealing seed while birds are allowed to feed uninhibited. An ideal feeder to go with our feeding station or as an individual feeder around the garden, it's strong and robust in its construction and holds a good quantity of seed to keep birds happy through the winter. The simple feeder design allows small birds to access the feed but keeps squirrels out - simple to use, the feeder features an opening lid for a quick and easy way to refill it. Supplied as a single seed feeder, without seed, ready for you to fill.